In the late 1880's, one stubborn Denver farmer still ran his livestock in a pasture near the corner of Broadway and Colfax. Such real estate, even then, was a mighty expensive place to graze cattle. Denverites jokingly called it the "Million Dollar Pasture". Yesterday's cow pasture is today's Civic Center! Civic Center Park is a neighborhood and park in Denver, Colorado. The area is known as the center of the civic life in the city, with numerous institutions of arts, government, and culture as well as numerous festivals, parades, and protests throughout the year. The park is home to many fountains, statues, and formal gardens, and includes a Greek amphitheater, a war memorial, and the Voorhees Memorial Seal Pond. It is well known for its symmetrical Neoclassical design. January - The City and County Building has a Christmas lights display up until the National Western Stock Show ends in mid January. March - Civic Center Park is at the end of one of the longest St. Patrick's Day parades in the nation. April - An annual pro-cannabis rally/ cannabis culture gathering is held in Civic Center Park every year on April 20th, otherwise known as 4/20. May - The largest Cinco de Mayo festival in the nation. June- People's Fair, a bohemian festival with various music, art, political booths, and other happenings. PrideFest, the annual gay pride festival is held at Civic Center, which is also the endpoint of the parade. Summer- There are various theatre and music events held throughout the summer at the Greek amphitheater. September- A Taste of Colorado is a food and music festival held during Labor Day weekend at the park. October- The park is the end point for a Columbus Day parade that often brings protests from American Indian groups. 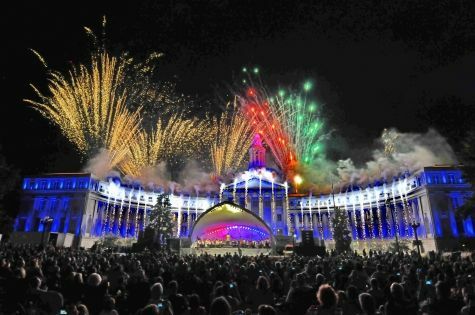 December- The Parade of Lights ends at the City and County Building which has holiday lights from the beginning of the parade until the National Western Stock Show. 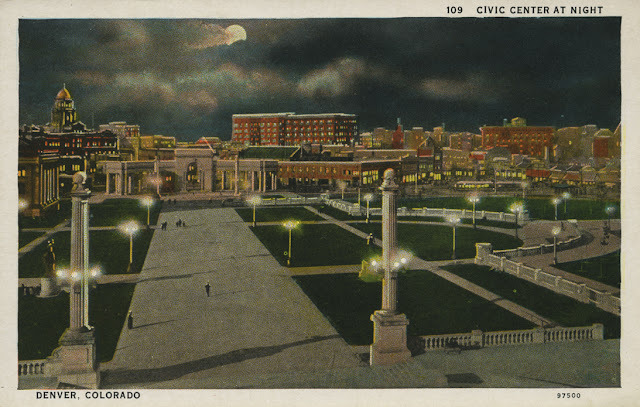 Formed in 2004 by a group of private citizens passionate about revitalizing Civic Center Park, the Civic Center Conservancy is a 501(c)(3) nonprofit organization that partners with the City and County of Denver to restore, enhance and activate Denver’s historic Civic Center. The Conservancy's efforts focus around the following four areas: advocacy for park needs and infrastructure improvements; events and programming to activate Civic Center; public awareness and engagement; and fundraising for capital improvements, activities and initiatives to support and revitalize the park. The Conservancy has a formal cooperative agreement with the City and County of Denver designating it as the official fundraising vehicle for Civic Center Park. 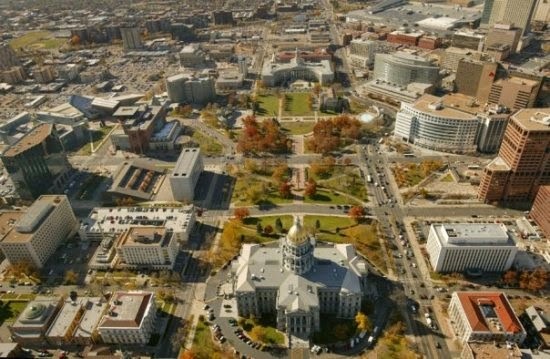 Advocated for Civic Center’s inclusion in 2007 Better Denver bond initiative. Denver voters approved $9.4+ million to restore the Greek Theater, Voorhies Memorial and Broadway Terrace. Phase I completed in 2010; phase II completed in 2011. The Civic Center Conservancy Design Committee provided input on the Broadway Terrace and nearby Bannock Street improvements. Hosted variety of arts and cultural programs to activate the park and engage the public in its future, including the weekly summer Civic Center EATS Outdoor Café entering its sixth year in 2011, and the 2010 launch of the annual Civic Center SOUNDS Independence Eve Celebration featuring a free Colorado Symphony concert and fireworks/light display; and the Civic Center Bike-In Movie Series, which launched in summer 2011. The Civic Center Conservancy is currently working to help the City develop and implement a long-term vision for the McNichol’s Building and create a Centennial Campaign plan to spur private investment in Civic Center enhancements, amenities and programming. In May 2011, the Civic Center Conservancy was honored with a Downtown Denver Award for contributing to the vibrancy of downtown Denver. In November 2011, the national City Parks Alliance designated Civic Center as a "Frontline Park," recognizing it as a "leading example of urban parks creating economic, environmental and social capital through innovative partnerships."